All this month on its Friday Night Spotlight screenings, TCM has presented a series of classic film noirs, with each Friday night devoted to movies based on or written by top-notch noir authors. 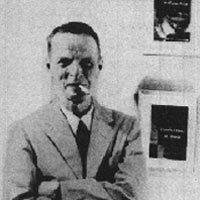 Tonight, the first spotlight shines on one of the darkest, loneliest, most prolific and most personally tragic of all the major noir authors: George Cornell Woolrich-Hopley, better known as Cornell Woolrich. Woolrich, who lived a tormented life, spent much of it typing out tales of suspense, shock and murder in his mother’s New York City suite in the Hotel Marseilles. And he wrote more stories that were turned into film noirs –sometimes great ones like “Phantom Lady,” “The Bride Wore Black” and “Rear Window” – than any of his competitors. In the ’30s and ’40s, he was virtually a story machine, cranking them out fast and flawlessly, earning a penny a word at first. These stories typically were set in the city, recognizably New York, where Woolrich lived most of his life – after a failed attempt to become an F. Scott Fitzgerald style novelist of flaming youth and a failed effort at being a Hollywood screenwriter and a Hollywood husband – something on which Woolrich’s lifelong homosexuality put the kibosh. Most noir writers are tough, hard-drinking, streetwise guys. Dashiell Hammett was a Pinkerton detective. 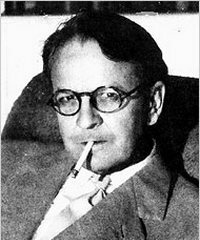 Raymond Chandler was a Canadian Army WWI veteran. Jim Thompson was a hard-nosed Texas news reporter. Woolrich drank, but he wasn’t tough. He was the most sensitive of the top noiristos. Many of his key protagonists are women and many of his best stories are written from a woman’s point of view. Woolrich was the kind of writer who could freeze your blood, creating a nerve-racking sense of impending doom. The best of his dark tales plunge the reader into dead ends and blind alleys and the shadow of the hangman: deadly traps in which his characters struggle often helplessly, sometimes escaping their harsh fates, sometimes not. But always Woolrich was a master of nightmare, the king of pulp suspense – as a lot of his colleagues and competitors believed. He wrote and sold his many stories and then, in the ’50s and ’60s, he started to dry up. He died alone, in his New York City hotel room, from a gangrene infection and leg amputation caused when he didn’t take care of a foot injury. When I read Cornell Woolrich’s stories, it’s always night fall, even if I’m reading in the morning or afternoon. And I always hear an insistent, pounding sound in the background – the percussive clack and ring of an old manual typewriter, an Olympia maybe, as Woolrich types out another of his terrifying stories. It is night. The trap is sprung. Death is in the air. He’s almost done. And when he’s finished and the clacking stops, he’ll pour himself a drink. 8 p.m. (5 p.m.): “The Leopard Man” (1943, Jacques Tourneur). With Dennis O’Keefe, Margo, Jean Brooks. Reviewed on FNB Nov. 10, 2012. 9:30 p.m. (6:30 p.m.): “Deadline at Dawn” (1946, Harold Clurman). 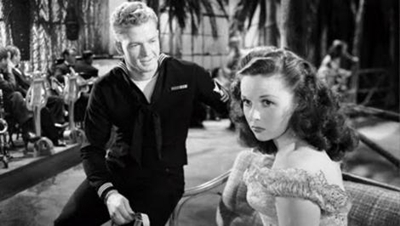 With Susan Hayward, Paul Lukas and Bill Williams. Reviewed on FNB Oct. 13, 2012. Chandler was an accountant for a Los Angeles oil company. Married to a woman many years his senior, Cissy Chandler, he drank himself out of his business career, and decided to try to pay his keep by writing. 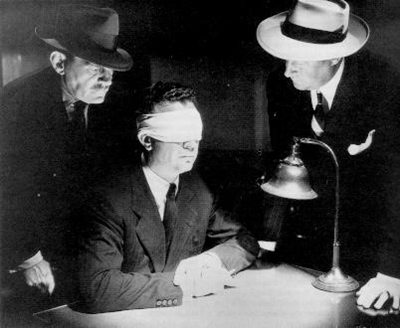 He took five months to write his first detective story, “Blackmailers Don’t Shoot,” which he sold to the best of the pulp crime magazines, Black Mask. He wrote plenty more for Black Mask and Dime Detective magazines, and then he “cannibalized” some of the stories to write his novels, including “The Big Sleep” (one of his masterpieces), “Farewell, My Lovely” (another), “The Lady in the Lake,” “The High Window” and “The Long Goodbye” (another). Most of his novels were made into movies, and Chandler helped adapt as films the books of other excellent writers like James M. Cain (“Double Indemnity”) and Patricia Highsmith (“Strangers on a Train”). Chandler wrote of Los Angeles, and of crime in the sun, on the Pacific shore and under the palm trees. He wrote of a world of bars and night clubs and rich people’s big homes and of cops, blackmailers, thieves and killers –the criminal classes of which he probably knew relatively little, certainly less than Hammett. But he wrote beautifully, in a style that was creamier and full of crisp gorgeous metaphors and witty turns of phrase than Hammett’s bare-bones facts. Chandler was born in Chicago but he was raised in England by his Irish-born mother and her family, and he has a good English writer’s impeccable sense of style and language. British writers, like novelist Iris Murdoch, tend to love him. Ian Fleming modeled James Bond after Marlowe. Of course, many of Chandler’s American colleagues, in or out of his time, loved his work too. Today, it is common to hear Chandler called the best of all the hard-boiled noir writers, and that may be true. He is also sometimes called the best American writer, period. And that may be true too. 1 a.m. (10 p.m.): “The Big Sleep” (1946, Howard Hawks). With Humphrey Bogart, Lauren Bacall, Elisha Cook, Jr. and Dorothy Malone. 3 a.m., (12 p.m.): “Strangers on a Train” (1951, Alfred Hitchcock). 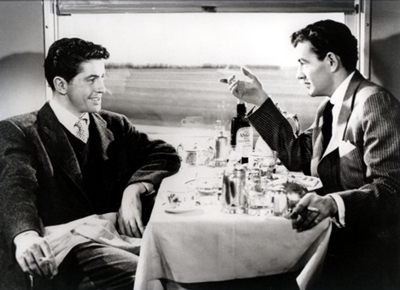 With Farley Granger and Robert Walker. 9 a.m. (6 a.m.): “Born to be Bad” (1950, Nicholas Ray). With Joan Fontaine, Robert Ryan and Mel Ferrer. Reviewed on FNB April 9, 2013. 3 p.m. (12 p.m.): “Armored Car Robbery” (1950, Richard Fleischer). With Charles McGraw, Adele Jergens and William Talman. Reviewed on FNB Jan. 28, 2013. 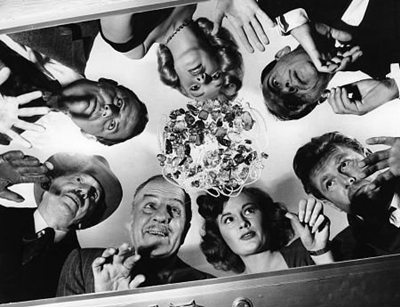 Sterling Hayden, Sam Jaffe and Marilyn Monroe lead “The Asphalt Jungle” cast. John Huston directed this seminal heist film. 6 p.m. (3 p.m.): “The Asphalt Jungle” (1950, John Huston). With Sterling Hayden, Sam Jaffe and Marilyn Monroe. 10:30 p.m. (7:30 p.m.): “Rebecca” (1940, Alfred Hitchcock). With Laurence Olivier, Joan Fontaine, Judith Anderson and George Sanders. 1 a.m. (10 p.m.: “Notorious” (1946, Alfred Hitchcock). With Cary Grant, Ingrid Bergman and Claude Rains. Celebrating 50 years of splendid Stones! Great to be back in the Detroit area! 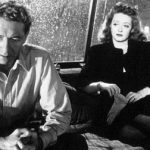 The Noir File is FNB’s guide to classic film noir, neo-noir and pre-noir on Turner Classic Movies (TCM), which broadcasts them uncut and uninterrupted. The times are Eastern Standard and (Pacific Standard). This month, TCM is presenting a series of classic film noirs, with each Friday night devoted to movies based on or written by (or both) one of six top-notch noir authors. This week’s Friday Spotlight features two noir novelists: James M. Cain and the lesser known Jonathan Latimer, a punchy pulp crime novelist who became one of the most prolific and reliable of all noir screenwriters. Latimer’s novels were notable for both hard-boiled suspense and sharp humor. Noir icon Cain was a hard-boiled prose master whose unsentimental stories of perverse sexuality and murder are unsurpassed. A one-time prospective opera singer, journalist, screenwriter and magazine editor as well as a best-selling novelist, Cain didn’t follow the self-destructive path of some of his noir colleagues, like Goodis and Woolrich. But he had one of the darkest visions, and one of the tightest, hardest-edged word-perfect styles of any of them. Together, they make an incredible double bill. And you can stretch it into a Cain triple feature by catching, right after “Postman,“ Anthony Mann’s 1956 “Serenade.“ Though not part of the noir writers series, it‘s adapted from another Cain novel, directed by noir master Mann, and it boasts an operatic background. The best American noir novelists were much admired by French critics and intellectuals, none more than Cain, who was one of the favorite writers of the great existential novelist and Nobel Prize winner, Albert Camus. 8 p.m. (5 p.m.): “Nocturne” (1946, Edwin L. Marin). Cop George Raft investigates night club murder of a songwriter. Standard stuff, well-written by Latimer. 9:45 p.m. (6:45 p.m.): “They Won’t Believe Me” (1947, Irving Pichel). More Latimer: Robert Young plays a rake, guilty of adultery, but innocent of murder. Susan Hayward, Jane Greer and Rita Johnson co-star. 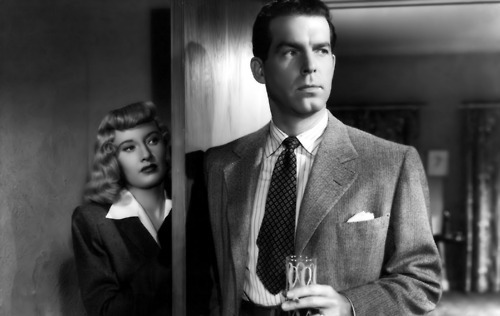 11:15 p.m. (8:15 p.m.): “Double Indemnity” (1944, Billy Wilder). With Barbara Stanwyck, Fred MacMurray and Edward G. Robinson. Reviewed on FNB, December 30, 2010. 1:15 a.m. (10:15 p.m.): “The Postman Always Rings Twice” (1946, Tay Garnett). With Lana Turner, John Garfield and Cecil Kellaway. Reviewed on FNB October 11, 2012. The exhibition is set to run at the Design Exchange from June 21 to Sept. 15. 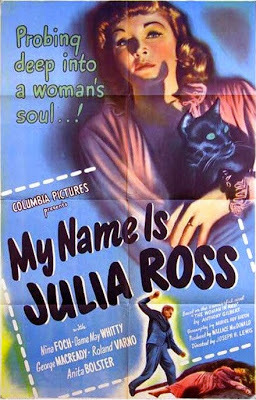 1:30 p.m. EST (10:30 a.m. PST): “My Name Is Julia Ross” (1945, Joseph H. Lewis). The B-movie prodigy Joseph H. Lewis made two great low-budget noirs: “Gun Crazy,” which almost everyone knows and admires, and the lesser known British-set thriller “My Name Is Julia Ross,” which was a sleeper in its time. It’s a kind of knockoff of the 1944 Ingrid Bergman–Charles Boyer driving-you-crazy suspense drama “Gaslight,” with Nina Foch as the title heroine. She’s a working (or not-working) woman hired for a mysterious job at a seaside Cornish mansion by a rich family (Dame May Whitty, George Macready), who then insist that her name is not Julia Ross, but that she’s instead Macready’s young wife who’s gone insane. Wonderful mood, images and atmosphere; it’s a crime Lewis didn’t make more films like this. More of the Noir File is on its way!